1. Want to share the nitty-gritty of your hose with a stranger? Then get an energy-analysis of your home. A stranger will enter your house, stay for six to eight hours, and investigate every nook-and-cranny including your closets, crawl spaces, behind appliances, and those parts of your basement that you have been throwing that "stuff" for the last four years. 2. As a result of the above named process, fun and exciting things will happen to your family. Some examples may be that your hot water is turned off because the "venting" doesn't meet code. Or you may learn that the folks that hooked up your gas line cut corners and it also doesn't meet code. 3. Speaking of stuff at home, Malcolm has slept well for the last two nights! I am a new woman again! 4. Just got the book Geography Through Art. It looks completely awesome and I recommend that even my non-homeschooling friends check it out. 5. Have you started your Christmas shopping yet? Did you know that Walmart had Christmas stuff out TWO WEEKS AGO?!?!? It was still summer two weeks ago! I think I will boycott all "Christmas-related Walmart shopping" as a result of my disgust. Problem is that Target is so. darn. far. away. 6. My book group started. The one my neighbor runs but that meets at my house because I have the most kids. I love love love it! 7. One of the kids have just alerted me to the fact that it is Malcolm's half-birthday. Sigh. So it is. Want to read more quick takes? Check out this site for more! Write about a task that you'd like to have a machine do for you. Use automatic in your sentences. I don't really have something that I wish was automatic. A school work machine might get a good score, but then I wouldn't be smart. Guidecraft has been producing quality wooden products since 1964. We already own several items created by guidecraft including the fraction action board, the ring sorter, the geometric puzzle board, and an order version of the pull along snail. We absolutely love Guidecraft items and when I heard that we had been selected to test out the Hideaway Country Kitchen I knew we would love it! This complete unit contains a sink, a stove ,an oven, a dishwasher, functioning knobs, and an adjustable clock. To say we love this kitchen would be an understatement. I adore this toy. I love love Love LOVE it. I love the simplicity of the design. There are no distracting characters or logos. I love how sturdy the unit is. I have never worried that it'll topple over on children. The pieces are large and securely fastened for young learners. I love how it is a complete kitchen in a single unit. Most of all I love how it's compact design folds up to a depth of only SIX INCHES! This size allows for easy storage under beds, in closets, or even in the trunk of a car for a trip to Grandma's house. I don't think any parent needs lessons in the importance of dramatic play. All of my children have engaged in various forms of dramatic play, both alone and with others, without any guidance or encouragement from me. It seems to be ingrained into their very being. The Hideaway Country Kitchen can foster that play by encouraging social interaction, language development, and developing a distinction between fantasy play and reality. My product testers were eager to get started using this product. The kitchen arrived on the day of a neighborhood gathering and we set it up for all the children to enjoy. Understandably, the real appeal was for the toddlers and preschool-aged children. Older children were attracted to it's sleek design, but quickly abandoned the play kitchen for more age-appropriate items. The two to four year-olds enjoyed extended play sessions and even returned to the kitchen after exploring other parts of the house. Both boys and girls were interested. Under my love seat! I am truly impressed! So what did my product testers think of this item? Well, I didn't actually play with this kitchen but I think it looks pretty neat. I think it should have come with dishes and play food. 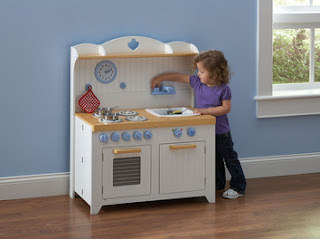 Mama, I really like that kitchen and I want you to tell the blog that I like the clock on the kitchen. The Hideaway Country Kitchen is designed for ages three and up and can be purchased from Guidecraft for $200. In addition to this kitchen and the items I listed above, Guidecraft offers high quality children's furniture, specialized wooden blocks, other dramatic play items like a puppet theater, and various art equipment and furniture. Disclaimer: As a member of the TOS homeschool review group, I received this item free of charge in exchange for an honest review on this blog. I received no other compensation. 2. My house is being over run by... no not children. Not yet, at least. By fruit flies. I think it is this warm and wet weather we are having. They are everywhere. Yuck. 4. Of course, as a result of this purchase there have been many tears shed from other boys who have not yet saved enough to buy their own Alien Conquest LEGO sets. 5. Malcolm is still acting like a terror. He wakes up about six times a night. 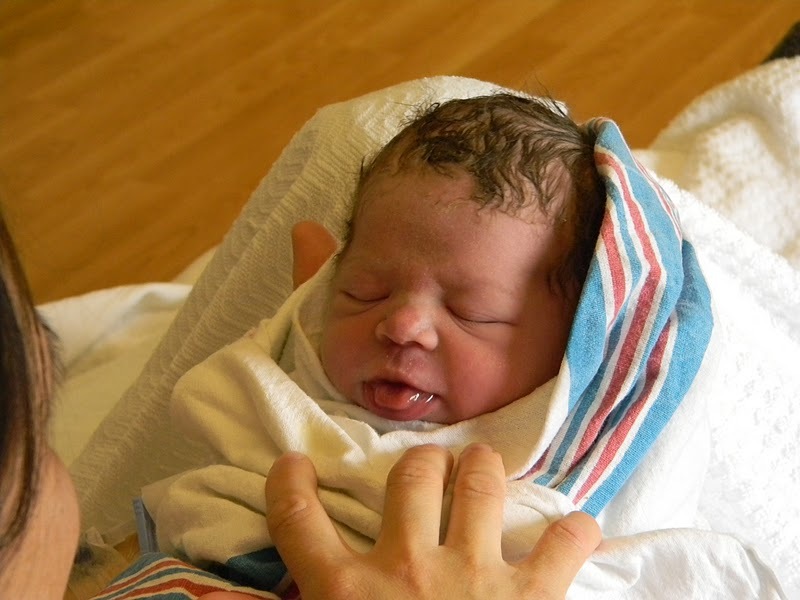 This from the baby that started sleeping ten hour nights at three or four weeks. I am like a walking zombie. Everyone says I will eventually get used to this, but that's impossible. Only a real weirdo would get used to this sleep schedule and I am not quite there. 6. We are making our way through this amazing list of children's literature. A few of the titles are already favorites around here, but we have found several fun new books. Isaac is loving Sarah, Plain and Tall and Skylark both by Patricia MacLachlan. James has read numerous new titles and his favorite of those so far is Chitty Chitty Bang Bang by Ian Fleming. 7. I am looking forward to a nice quiet weekend and I think we will have one in November after soccer is over and we go to Georgia for our annual November visit. The Friday classes for homeschoolers has started again at the collge. The kids love these classes and we think it is the perfect way to spend a Friday afternoon. Isaac is in three classes: a chemistry class, a natural history class, and an ocean class. She's finally old enough to attend and she is thrilled! Margaret is in the first session of the preschool class. Henry isn't taking any classes after so many false starts last year. But he still looks cute when he is all ready to go. This guy still can't be far from the milk truck and has to skip Step-Up this semester. James is in a mythology class and a drawing class. 1. Have you ever mopped your floor and it actually got worse? I have. Big streaks of dried dirt appeared after it dried. So not worth the effort. 2. The boys are selling popcorn again. All three older boys are now enrolled in Cub Scouts. The required amount of sold popcorn per scout this year is $500. That is so not. going. to. happen. We will just sell as much as we can and be proud of how much we do sell. If you are interested in buying from us, click here to access our personal on-line family account. 3. Malcolm has been in an awful terrible horrible mood lately. Teeth? Tummy ache? Temperament? 4. I have decided, again, to get rid of stuff. I have too many children to be taking care of a bunch of stuff. Since the kids have their Friday classes again, I can easily drop stuff off on the way to their classes. My goal is two large bags a week for eight weeks. 5. Anyone use IEW Level A? I feel like a fish out of water using this program. It is far too valuable to be "just winging it." I have read numerous blogs, but I still just don't feel like I am teaching it as well as I could be. 6. Speaking of getting rid of stuff... does anyone remember me from my neckalce making days? I am selling all my beading supplies and putting the money towards our adoption. If you are interested in any beading and necklace making supplies, let me know. A very grubby Margaret holding a half-eaten banana that she insisted must be frozen. But alas! It is now too cold and we must hold it in this kitchen towel until it is warmer. Several hours later, said banana was found abandoned in the living room, still wrapped snugly in the kitchen towel. Guess who now has TWO teeth?